Construction at Oakwood Shores. Photo by Jacqueline Thompson. The Chicago Housing Authority’s Plan for Transformation is showing up in a BIG way on the grounds that used to be the Ida B. 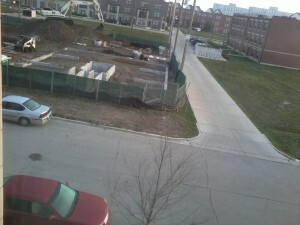 Wells Homes public housing development. There is even a new name assigned to the area, Oakwood Shores, yet to some people, the area will always have a tag – that’s where the Ida B. Wells Homes used to be. But never mind that, the Plan has erased the old worn buildings with more thoughtfully built accommodations. For instance, the fabulous new senior citizen building at 3750 S. Cottage Grove Avenue which opened in the fall of 2011, complete with solar panels and an interior solarium for in-door/out-door visiting with easy chair seating, is a work of art in terms of its interior design. 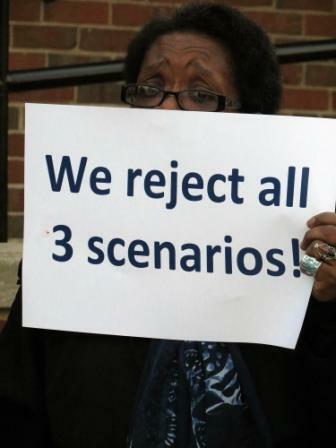 A protestor in the Lathrop Homes objects to all three redevelopment ideas proposed by the Chicago Housing Authority Nov. 15. Photo by Mary C. Piemonte. Tenants and their advocates protested the Chicago Housing Authority’s redevelopment plans for the Lathrop Homes public housing site on the North Side, which is slated for demolition and replacement by a mixed-income community consisting of an array of for-sale, affordable rental and public housing apartments. On Nov. 15, CHA held an open house inside the New Life Community Church, 2958 N. Damen Ave., to present three concepts for the Lathrop redevelopment and pose questions to Lathrop Community Partners, the development team selected to help revitalize the 32-acre public housing site that was placed on the National Register of Historic Places in 2012. But outside the church, members of the Lathrop Leadership Team – composed of tenants and their advocates – declared that developer’s plans “three dense scenarios, and one destructive idea.” Some of the protestors held signs ridiculing the three concepts; one sign featured a picture of the Three Stooges television characters, to whom the three concepts were compared. September 12, 2012 –Elected leaders of Chicago’s public housing families today issued the 2012 Strategies and Recommendations Report, a comprehensive vision for the future that would see the city provide quality housing to many more low-income families who need it in these tough economic times. Twelve years after the Plan for Transformation for the Chicago Housing Authority was launched by Mayor Richard M. Daley, much work remains to be done. All of the city’s public housing high-rises for families have been demolished and a small number of mixed-finance communities have been built, but large tracts of land across the South and West sides remain vacant, awaiting a new vision that will deal with the realities of the current housing market. CHA remains the landlord, meanwhile, for more than 130,000 people in low-rise family developments, senior citizen high-rises and private apartments rented through the Housing Choice Voucher program. Beginning today, residents of the Lincoln Square neighborhood on the North Side can apply to get into a small number of the Chicago Housing Authority’s two, three and four-bedroom units in the area. CHA will accept applications until July 20. Those who want to apply should go to CHA’s North East Scattered Sites Satellite Office, the garden unit at 2117 W. Giddings St. from 9 a.m. to 5 p.m., Monday through Friday, and from 10 a.m. to 3 p.m. on Saturday, July 7, and Saturday, July 14. Some of the public housing units will be accessible for people with disabilities. You must be 18 years of age or older at the time the application is submitted and you must reside in Lincoln Square all through the application process. A picture ID is required along with two documents that prove your address, according to the CHA press release today. You must qualify to get a two-, three- or four-bedroom public housing unit under federal guidelines. After the application period ends July 20, the CHA will have an electronic lottery to determine each registrant’s place on the Wait List. Resident Survey Ends June 1!!! Click This Link Today! Please follow the link below and fill out the following Survey. This Survey will help Resident Leaders negotiate with city officials to make sure the Plan for Transformation 2.0 truly works for all Chicago families. Everyone who fills out the survey will qualify to win a laptop computer or a $250 gift card. Feel free to share the link with anyone you know. Anyone who fills out the survey is eligible to win the prizes. ACT SOON, the survey closes June 1. Please call the Central Advisory Council at (312) 913-7828 with any questions or concerns! There are more than 51,000 families in Chicago’s public housing system, including households in the traditional family style developments like Altgeld Gardens, Lowden Homes and Bridgeport Homes, as well as senior buildings and tens of thousands of families who rent in the private market using Housing Choice Vouchers (formerly known as Section 8 vouchers). All of these residents are represented by the Central Advisory Council, an elected body of tenant leaders who negotiate on tenants’ behalf with the Chicago Housing Authority, the U.S. Department of Housing and Urban Development and other government agencies. Recently, the CAC put out its annual calendar, which contains a huge quantity of useful information for tenants, and we are providing the 2012 Tenant Calendar in PDF format, free of charge, for either download or on-line viewing. How do I save money on Electricity and Gas? In a sign of the times, the calendar also has a special section for Housing Choice Voucher holders whose building is in foreclosure, and the names and addresses of every alderman in Chicago. You can click above or on the following link to get the 2012 Tenant Calendar. Mayor Rahm Emanuel's choice to head the Chicago Housing Authority, outgoing Charlotte, North Carolina, Housing Authority CEO Charles Woodyard. Photo from Charlotte Housing Authority website. Carlos Ponce, interim chief of the Chicago Housing Authority is out, and Charles Woodyard, the CEO of the Charlotte Housing Authority since 2002, is in. Woodyard will govern CHA’s family and senior housing stock, and oversee the Plan for Transformation, which calls for 25,000 units of fully rehabilitated or renovated housing by 2015. 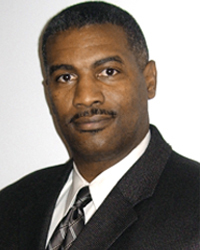 Ponce was put in place after former chief Lewis Jordan resigned after it was discovered that he and other CHA staff members were frivolously using credit cards for things not pertaining to the general operation of the public housing stock. 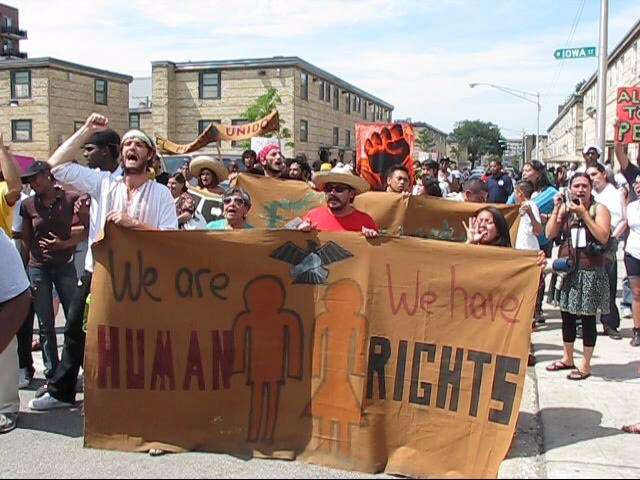 Residents and their supporters protest in the Cabrini-Green Row Houses in June 2010. Photo by Mary C. Piemonte. Tenants of the Cabrini Green Row-Houses are preparing to battle the Chicago Housing Authority for “reneging” on their promise to rehab all remaining units at the North Side public housing complex. The final high-rise in Cabrini-Green was demolished this past spring, but 534 low-rise units remain in the complex. In 2008, CHA received approval from the federal government to rehab the row houses. However, only 146 units were rehabbed in 2009, leaving 438 units in disrepair, with a great majority left vacant. Only 33 of those are currently occupied, “creating a 92% vacancy rate,” according to the CHA, which announced late last week that it will not continue rehabilitation and will instead boot out the remaining public housing tenants in the non-rehabbed section of the row houses. CHA claimed that “persistent criminal activity” in the area “forces” them to make the tenants relocate elsewhere. This week, I was honored to appear on “Chicago Newsroom,” hosted by veteran broadcaster Ken Davis, along with fellow guests Art Golab, Database Editor with the Chicago Sun-Times, and Charlie Meyerson, a regular voice on Chicago radio. We discussed the progress of new Chicago Mayor Rahm Emanuel, the ouster of Chicago Housing Authority CEO Lewis Jordan, the future of the Taste of Chicago and other issues.